Our righteous Father Euphrosynos was born of peasant parents and consequently was reared without schooling. Later he entered a certain monastery, was robed with the holy Schema of a monk, and served the fathers. But since he was of coarse country upbringing, he remained in the difficult obedience of serving in the kitchen, being scorned and mocked by some of the monks who had forgotten the purpose for which they left the world. Yet the blessed one endured this contempt with a most courageous heart, wisdom, and tranquility of mind, not being troubled in the least by these things. Thus he seemed illiterate according to his manner of speech, yet he was not such in the true knowledge which he possessed, as we shall see from the following. There was in that monastery at the same time as the ever-memorable Euphrosynos a certain pious priest who made fervent entreaty that it might be revealed to him the good things which they that love God shall enjoy. One night, therefore, while the priest was asleep, it seemed as though he were in a certain garden. With amazement and ecstasy he beheld most delightful things. He also saw Euphrosynos the cook of the monastery, who stood in the midst of the garden and partook of the diverse good things of that place. Having come nearer, he inquired of the blessed one to whom this garden belonged, and how he had come to be there. Euphrosynos replied, "This garden is the abode of God's elect, and by the great goodness of my God I have my dwelling here." Then the priest asked, "But what dost thou do in this garden?" He answered, "I have dominion over all the things which thou dost see here, and I rejoice and am filled with gladness at the vision and noetic enjoyment of them." Again the priest said, "Canst thou give me something of these good things?" "Yea, by the grace of God, take from whatever thou dost wish." 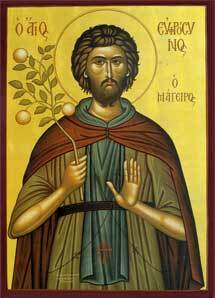 Then the priest pointed to some apples and asked Euphrosynos if he might have of these. Taking a portion of the apples, the Saint put them in the priest's outer garment and said "Receive that which thou hast requested and take delight therein." At that moment the wood was sounded for the fathers to arise for the midnight service. The priest, having awakened and come to himself, considered the vision to have been a mere dream, but when he stretched forth his hands to take his outer garment -- O the wonder! -- he discovered in reality those very apples which Euphrosynos had given him in the vision, and he wondered at the marvelous fragrance which still remained with them undiminished. Arising from his bed, he placed the apples aside and hastened to church. There he saw Euphrosynos. He approached him and besought him with oaths to reveal where he had been that night. The blessed one replied, "Forgive me, father, but I went nowhere at all this night, but just now I have come to church for the service." The priest answered, "For this reason I charged thee with oaths, that thou wouldst be obliged to make manifest the great works of God -- and thou art not persuaded to make known the truth?" The humble-minded Euphrosynos then answered the priest, "I was there where are found the good things which they who love God shall inherit and which thou hast sought for many years to behold. There thou didst see me partaking of the blessings of that garden; for God, wishing to make known to thy holiness the blessings of the Just, hath wrought such a miracle through me, the worthless one." "Those delightful and most fragrant apples which thou just recently placed upon thy bed. But father, forgive me, for I am a worm and not a man." At the end of matins, the priest related to all the brethren his vision and showed to them the apples from paradise. The brethren could sense their ineffable sweet fragrance and felt great spiritual joy in their hearts, and they marveled at all the priest narrated to them. And hurrying to the kitchen to reverence the blessed Euphrosynos, they found that lo, fleeing the glory of men, he had already secretly departed from the monastery and was not to be found. The brethren divided the apples among themselves and gave portions to many who visited the monastery as a blessing, and especially for healing, because whoever partook of theses apples was cured of their infirmities. And thus many received benefit from the gift of the holy Euphrosynos. They recorded the vision not only upon tablets, but also in their hearts. And they strove greatly to make themselves pleasing unto God. Thou didst live righteously in great humility, in labours of asceticism and in guilelessness of soul, O righteous Euphrosynos. Hence, by a mystical vision, thou didst demonstrate most wondrously the Heavenly joy which thou hadst found. Deem us also worthy to be partakers thereof by thine intercessions. We laud Saint Euphrosynos, the most wondrous ascetic, who took up the Cross of Christ and shone forth in humility; for by the vision of Paradise his Christ-like virtue by God was made manifest. Pray to God for us, Saint Euphrosynos. posted by biss | 11/26/2005 05:55:00 p.m. This is great, Biss. Please do send me and Krista invitations. I think you have our emails. Oh this is cool! yeah! that pretty much sums it up. I love it! Invite me! Invi i i i i i i i i i i ite me!I have something called St Seraphim soup from this cool book called monastery soups butcha can't have it till you invi i i i i i i i i i i i i te me!